Coach Chris Meldrum is SCRC Founder, President and Head Coach. Coach Chris is Level 1 and Level 2 USRowing coaching certified, USRowing Safesport certified, Red Cross CPR and AED certified, and has NCIS background clearance. Coach has been training SCRC athletes since the program's inception. As a Marquette University collegiate athlete, Coach knows first-hand the work and dedication required to achieve elite sports performance. Coach's training philosophy is: 1) safety comes first, 2) work hard, and 3) have fun. She believes enthausiastically in the ability of rowing to "change lives" and cares about club members as young adults, not just rowers. 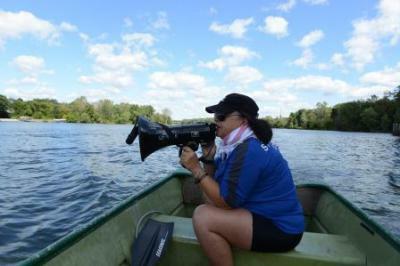 Her approach and experience have trained and supported almost a dozen athletes to advance into collegiate rowing programs in just two short years. Coach also understands that not all rowers will compete at the college level and strives to provide a rewarding, positive rowing experience for athletes of all levels. As the daughter of a U.S. Marine Colonel Chris is passionately supportive of adaptive and paramilitary rowing programs, a member of Team Red, White & Blue, and has received the honorable "Wounded Warrior Supporter" badge. Chris is originally from Detroit and is a resident of St. Charles. Her son, Gordon O'Brien, is a rower for Marietta College.